This is the ideal fall outfit- mixed textures, cozy layers, and a warm color palette. I picked up this fur vest last week and couldn't wait to wear it over the weekend. The quality is amazing and the price is on point- I do suggest ordering one size up for layering. This hat from Rag & Bone is a new favorite of mine. It solved all those bad hair days and not to mention it's perfect for chilly mornings. Those leaves! That never happens here and I'm so jealous! This is such a fun looking! I've been searching for a faux fur vest for a while and I love yours! I highly suggest getting this Asos ones- email me if you would like a couple more options. I just found your blog - too cute! 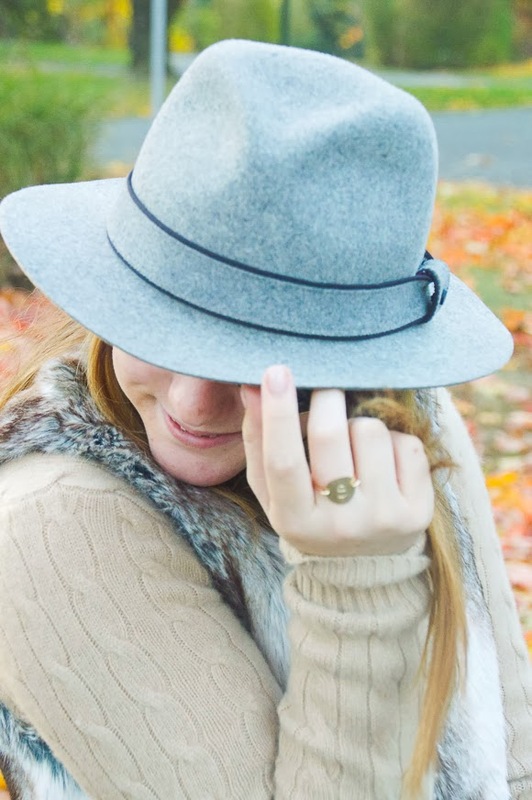 Love the fall layering and the hat to top it off is perfect! Thank you! (: Hope you enjoy the blog. Love this outfit! That faux fur jacket is perfect!